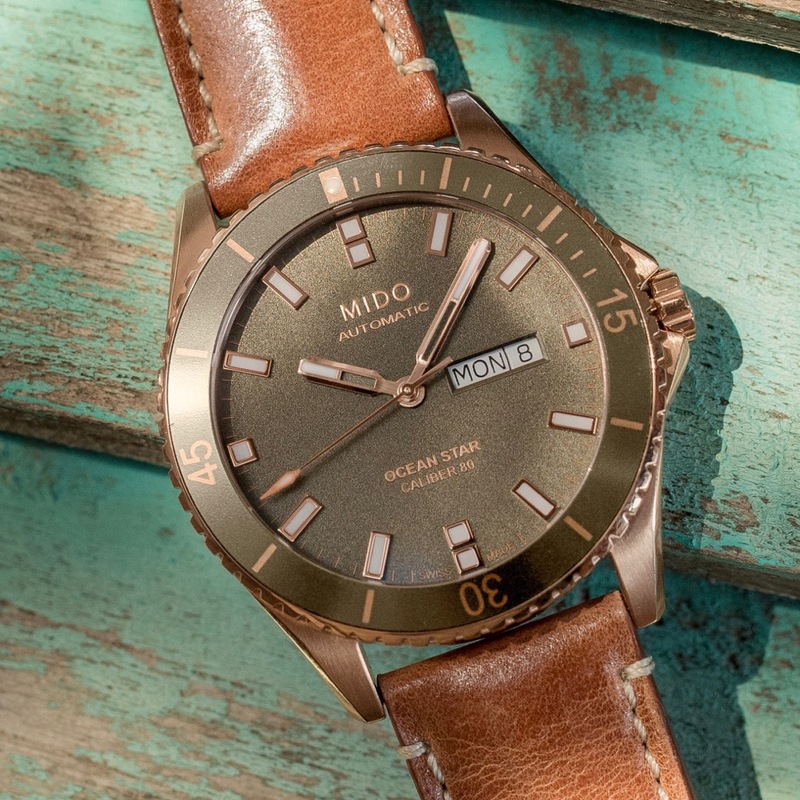 Home Watch Types Automatic Ahoy there, it’s the new Mido Ocean Star Automatics! Even though we’re not in the midst of watch show season, there have still been plenty of new watch announcements as of late. The latest to hit the wire – yes, even more recent than yesterday’s Apple Watch hullaballoo – are two new iterations in the Mido Ocean Star Automatic lineup. As you might expect with a name like the Mido Ocean Star Automatic, these are watches intended to be on or in the water. And if you didn’t expect it, then you’ll be rather surprised by the polished starfish on the caseback, no? Any which way, the 42.5mm steel case (here, with pink gold PVD finishes) carries a 200m WR rating, which will be plenty to keep things nice and dry if you decide to take a dip. All of that is to keep the Caliber 80 movement (read up on those movement specs down below) safe while it accumulates that 80-hour power reserve from your movements. For these new Mido Ocean Star Automatic models, there are two versions that were introduced. While both feature the pink gold PVD finishing on the case, hands, and indices, you have two very different colors for the straps. The one that everyone will expect me to gravitate towards is the dark blue version, which does cut a more traditional, dressier look. Surprising even myself, though, I find myself drawn more towards the green dial version and it’s brown leather strap. It just has a bit of a lighter look to it, something that feels more fitting as we head into fall. Then again, that’s just me. Would I buy one for myself based on what I’ve seen? Well, I’m pretty set for water-borne watches, but that green one is alluring. Automatic Mido Caliber 80 (ETA C07.621 base), 111⁄2’’’, Ø25.60 mm, height: 5.22 mm, 25 jewels, 21,600 vph, NIVAFLEX NM mainspring, ELINCHRON II balance-spring. Finely decorated Elaboré-grade movement, oscillating weight decorated with Geneva stripes and the Mido logo. Adjusted in 3 positions to ensure greater accuracy. Up to 80 hours of power reserve. Stainless steel with polished and satin-finished pink gold PVD treatment, unidirectional rotating bezel with green or blue polished aluminium ring, white Super-LumiNova® dot at 12 o’clock, Ø42.5 mm, 2 pieces, sapphire crystal with anti-reflective treatment on both sides, screwed crown, case back with polished starfish in relief, engraved serial number, water-resistant up to a pressure of 20 bars (200 m/660 ft). M026.430.36.091.00: patina leather, ecru stitching, pin buckle in stainless steel with polished and satin- finished pink gold PVD treatment. M026.430.36.041.00: blue synthetic with technical fabric-style texture to give high resistance to wear, blue stitching, pin buckle in stainless steel with polished and satin-finished pink gold PVD treatment. Grained, polished pink gold PVD applied indexes with white Super-LumiNova®, day and date at 3 o’clock. Hands: Satin-finished and polished skeleton hour and minute hands with white Super-LumiNova®, seconds hand with orange Super-LumiNova® on the tip. Next articleIs the Heitis Okeanos Explorer your new weekend diver?